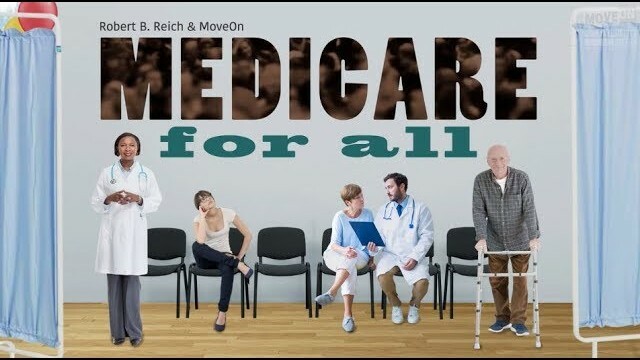 Robert Reich explains why we must introduce a Medicare-for-All health care system. This entry was posted in medicare supplement and tagged Bernie, Economics, Economy, health care, healthcare, Medicare for All, politics, robertreich, single payer. Bookmark the permalink. Pink Floyd wants the wall. +Static Void That isn’t libertarian. I’m on Medicare and I support Medicare for All. Throughout my healthcare career I’ve barely met but a few elders who DON’T HAVE to use Medicare. Eventually for US ALL we’ll be faced with a choice between retiring or switching to per diem employment to keep our health insurance. +Frederic Bastiat Excuse me for not replying sooner. I didn’t see your post until just now. So, I realize that the term “welfare” has become anathema to “conservatives” these days in spite of the fact that promoting the general welfare is one of the first things mentioned in the Constitution as a reason for having a government in the first place (see the Preamble and Article 1 § 8) and its motivation for taxation. You must realize that with healthcare, we never know our risks. Even people with preexisting conditions could get over them and not need medical care for them again. Some fortunate individuals go through life with no health problems and then drop dead of old age. But the vast majority has the need of a doctor from time to time for conditions varying from minor to major, and it is a _civilized_ society that allows for people to have their conditions treated without its driving them into bankruptcy. These days especially, with expensive medical equipment and treatments, most people can’t afford a major illness. So we pool our resources, everyone pays into it in amounts they can afford, including those who are perfectly healthy, and when we get sick or injured, we can afford to go to the doctor and have our conditions treated. Do you really have a problem with this? Sounds like promoting the general welfare to me. For a short video that might shed some light on this issue for you, please check out https://www.youtube.com/watch?v=VuxZnhlr89I. It’s only 40 seconds long. Surely, even in your convoluted world, the life of a child is worth more than the money it costs to treat her. If her condition had caused her family to go bankrupt, a distinct possibility under our former system, how would that serve the general welfare of this child? You might think about all this, asking yourself if it were _your_ problem or your _child’s_ problem, what you would like to see happen. +Frederic Bastiat Is profanity something you normally use to make your arguments? It’s not working for me. It just makes you sound like a nasty jerk. Furthermore, rising costs of medical treatments may have corresponded to the elderly having their needs met, but there are other reasons for the rise, including more expensive equipment and treatments (have you ever seen a CT machine? ), drug companies out of control with the prices of their medicines, hospitals and insurance companies operating for profit instead of as nonprofits, and people living longer and requiring more care at the end of their lives. But I’m sure it’s the _money_ (the mammon you worship) that is more important to you, right? If anything costs more, it must be abandoned even if it saves lives, right? Nice. And never mind that Medicare for All (younger people would pay into it just as they pay into insurance now, but it would cost less) can’t be implemented because (horrors!!) socialized medicine, even if it would save us all trillions of dollars. BTW, how come “conservatives” are such bullies? I already have Medicare because of my age. I also enrolled in a Medicare Advantage program. Both should be available for Americans. +Ramiro Acosta How about reversing that tax break to the top 1 and 2 percent that never should have happened. I paid into social security and medicare for over 44 years. I would have continued working, and continued to contribute, but was stopped by age and disability discrimination. People that work would contribute and there shouldn’t be a cap on social security that keeps the rich from contributing throughout the year. We all contribute and then we all benefit. I have both myself, but medicare is a grossly inefficient system with it’s fee for service principal. We need a single payer system. +Richard Wagner They want to make it a single payer system. It will have to be tweaked to improve it. I’m not sure what will happen to Medicaid for the poor. Kay hayman, why does everyone keep asking how we’re going to pay for this? We have plenty of money when the Republicans need it. Trump wanted to build a wall with our tax dollars, he takes money from FEMA to put children in cages, check out the healthcare plans elected officials have, and yes giving tax breaks to the 1%! Did Trump really need to allocate 639 billion dollars to the military? We spend more on military than the next sixteen countries all together! Most of these countries are allies! .How many yachts do the wealthy need? We people have got to start demanding what we want. Not waiting for them to drop us a few crumbs. I’m glad you finally addressed this topic Rob, but this definitely would have been much more useful if it came out earlier when mainstream media had been doing their best to try and counter it. A whole LOT of points would’ve been more useful, if mentioned earlier on, but it’s mainly HINDSIGHT that’s ’20/20′ (or at least, better than present-day perspectives). But, with the correct actions taken from here on, the goal may not be hopeless. It MUSTN’T be. Medicare $156 month after age 65 including the monthly deductions for the past 45 years of work. I’d get a Medigap plan you never know that 20 % can add up,been though it . Richest country on Planet but can’t afford Medicare For All? Small countries like Taiwan ect not very rich but they can Afford? I support and am running on Medicare For All in 2020…and a whole lot more. Marcus Perriello Hopefully you’re at least 35 years old already. I highly doubt that high school student running in 2016 would have even had a chance to become president at all, even if he was for one of the 2 big political parties. He was way too young. Also, you better be prepared to raise hundreds of millions of dollars if you are running for president. Even if you were running for either branch of Congress, you would still need to raise tens of millions of dollars or more. +Graham Turner I’m 38, and I’m running for Congress in Virginia. I don’t take corporate PAC money, so I’ll never beholden to corporations or wealthy elites. Winning on small-dollar donations is difficult, but the major difference is I actually have a highly Progressive platform and will be talking to people about it. It’s one thing to raise millions of dollars; it’s quite another to have actual substantive issues and sound ways to address them. +Marcus Perriello Which district are you running in? +EisenhowerRepublican I’m running in the 8th Congressional District, which encompasses from Pohick and Lorton all the way up to Tyson’s Corner. We all want one payer, everyone I know or have spoken to. Thank you for your video, amazingly there are still people who do not understand what this is. If the politicians really mean to give this insurance they would be more informative and direct. Doesn’t really seem much push toward this. No one in their right mind wants the system we have now. Also I believe that the original intent of Medicare at its inception in 1965 WAS Medicare for all via taking in extra people each decade. Straight Blue Ticket right here! GO out and VOTE! Education is the key. Maybe develop a panel to find new ways to get this message out to those who truly do not understand how this works. I’ve been for this for years. Voted ALL BLUE and progressive this morning around 10:00 a.m. More turnout in general, more young, women, and PoC. All great signs! If this happens, trump will say it was his idea all along. If it dont, trump and GOP will blame the dems. I’m for two tier system just like Germany. Public for the average and private if you want better quality. Medicare for all sounds similar to the National Health Service we have in the U.K.
shlibber Didn’t know that. Thanks for the info. The U.K. owes him a huge debt. It is similar the only difference is Medicare is just a Public Insurance System the government pays the bills and thats it. All hospitals and doctors offices remain privately ran and operated. The government doesn’t own the hospitals and healthcare workers are not government employees. Brad Kohl It still sounds essentially a private health care system with bills paid by the government.. quite a bit different I think but maybe just as good. +Richard Walsh absolutly every American is covered no one is out its free at point of service! I would personally like a National Health Service like England where all hospitals are nationalized but this is just as good! All the other first-world countries have some variant of single-payer health care. They all pay a lot less per head for it, *everyone* is covered and they get better outcomes overall. A healthier workforce is a more productive workforce. Preventive medicine results in better health and fewer sick days. So three reasons in its favour: it costs less, it covers everyone and it has better results. Any one of those reasons alone ought to be sufficient. Whether on humanitarian or economic grounds, there’s no reason not to have it. I live in the UK where we have such a system. I live in one of the parts of the UK where medicines are *free. * It *can* be done. It not only doesn’t break the bank, it costs less. It’s a no-brainer. Unless you’re making a lot of money with the system the way it currently is. And have the best politicians money can buy. For ALL the reasons outlined in this video, a Medicare-for-All health care system is an absolute MUST! Perhaps with the cooperation of the Powers That Be, it’ll be a reality – ASAP! Your great. I didnt fully understand it until you explained it clearly. Agreed. Healthcare for all as a human right, not a privilege. Oh heck yes! Medicare for all should be a right!